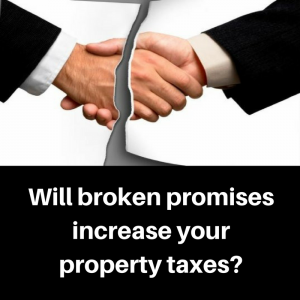 Dems: How much will your city lose if Republicans break property tax promises? The table below is based on information from the Iowa Department of Management.Â Next to each city is the amount that city would lose if the State of Iowa fails to fund the property tax backfill. Senate Democrats encourage you to tell Governor Reynolds and Iowaâ€™s Republican legislatorsÂ to keep their promises.Â If they donâ€™t, property tax increases and cuts in local services are sure to follow. This is an alphabetical list of all Iowa cities.Â Enter the name of your city in the search box at the top of the table. For more information, contact the Senate Democratic Research Staff. Here are links to recent news coverage of this issue.